Starting today, a new package is available to guide countries of the Region in establishing systems and plans for effective ERC tailored to their specific contexts. The package is the result of a pioneering project launched by WHO/Europe in March 2017.
plan adoption to update the national ERC plan and integrate it into national preparedness and response plans. 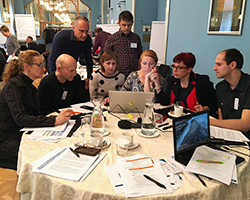 The first phase of the ERC project, financed by the Federal Ministry of Health of Germany, focused on working closely with 13 countries of the Region to pilot the 5-step capacity-building package at different stages. A newly released report details this phase, which targeted Armenia, Bosnia and Herzegovina, Estonia, Kyrgyzstan, Romania, Serbia, Slovakia, Slovenia, Sweden, Tajikistan, Turkey, Turkmenistan and Ukraine. ERC strongly affects responses to and outcomes of public health emergencies. It is a vital thread that runs through the prevention, preparedness, response and recovery phases, and yet there have been few large-scale efforts to build national capacity in this area until now. On 1 March 2018, Turkmenistan became the first country of those enrolled in the project to adopt a national ERC plan. The second implementation phase of the 5-step package has been underway since March 2018, providing continued support to pilot countries and territories while expanding to other priority countries in the Region. With sustained financial support, WHO/Europe’s ERC project will continue to meet countries’ and territories’ requests to increase their ability to communicate before, during and after emergencies, and ultimately help make Europe and the world safer from public health emergencies.